I first saw the Undertones at a gig in Middlesbrough Rock Garden on 4th March 1979. The place was completely jam packed and the band were simply incredible. There was a garage pop sensibility about this band, with Feargal’s wonderful warbling vocals, great tunes with instantly catchy hooks, cutting buzz guitar, and honest quirky songs about teenage angst and day to day life. The Undertones were a flash of welcome relief from the heavier political sentiments of many of the punk acts of the time. Their performances were pure raw energy, and they looked like (and were) young guys who had just stepped out of their front room rehearsals. The Rock Garden gig came soon after the release of the momentous “Teenage Kicks” single and before the release of their equally important first album. The original line-up of the band was Feargal Sharkey (vocals), John O’Neill (rhythm guitar), Damian O’Neill (lead guitar), Michael Bradley (bass) and Billy Doherty (drums). A few months later and the Undertones had been in the UK Top 20 with “Jimmy Jimmy” and were headlining theatres and civic halls up and down the country. I saw them at Newcastle City Hall on 8th October with support from Tenpole Tudor (“Swords of 1,000 Men”). They were back in the charts in 1980 with “My Perfect Cousin” and the wonderful “Wednesday Week” which was my favourite song of theirs. 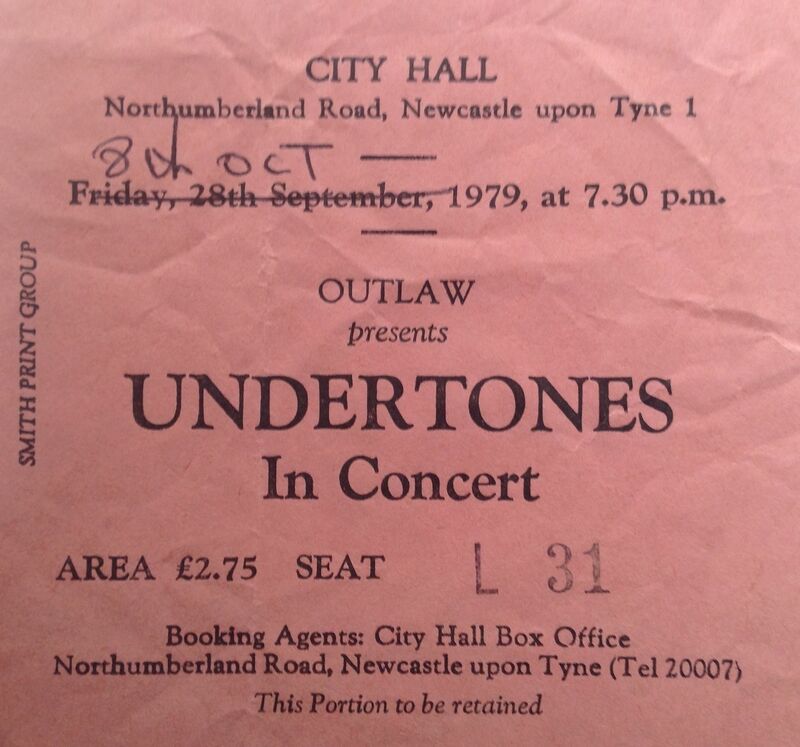 The Undertones returned to Newcastle City Hall on 8th June 1980 for another glorious performance. 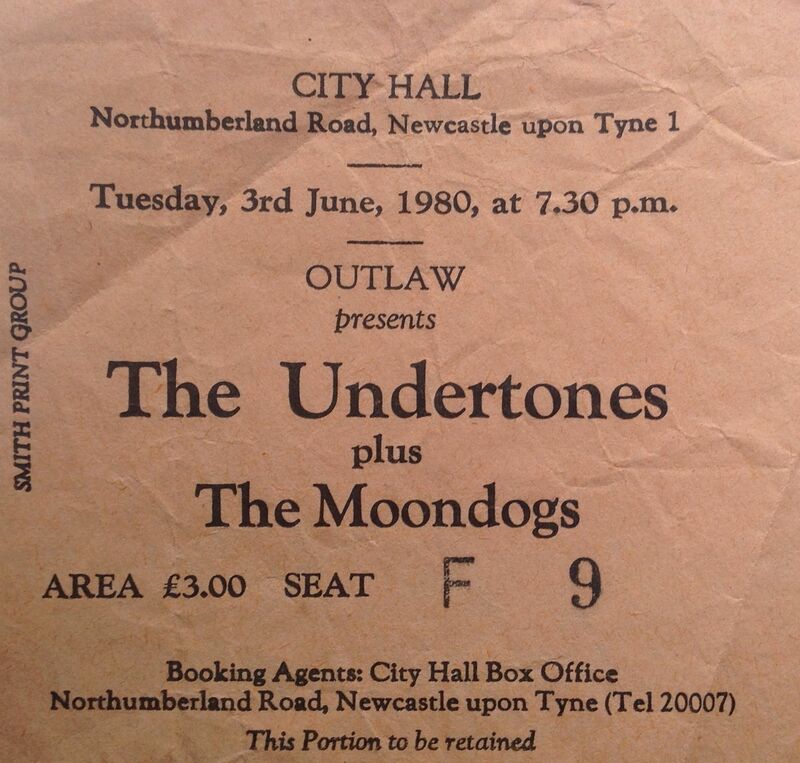 Support this time came from the Moondogs, who were a fellow Northern Irish band. Chrissie Hynde moved to London from the USA in 1973, finding work at the NME and at Malcolm McLaren and Vivienne Westwood’s clothes store. She became involved with the early punk scene, and hung around with the Pistols, The Clash and The Damned. She had a few short-lived bands and then formed the Pretenders in 1978 with Pete Farndon on bass, James Honeyman-Scott on guitar, and Martin Chambers on drums. They released a cover of The Kinks “Stop Your Sobbing” in 1979, followed by the great “Kid”. It was around the release of “Kid” when I first saw the Pretenders on 3rd August 1979 at Newcastle Mayfair. The Mayfair was a big heavy metal haunt, and the audience would give punk and new waves bands a hard time. The Pretenders were no exception, and they faced an onslaught of beer glasses. If I remember right, Chrissie Hynde put on a brave front arguing with the hecklers, but they eventually abandoned the gig, soaked with beer. Nonetheless, they played a great set, and left me wanting to see them again. 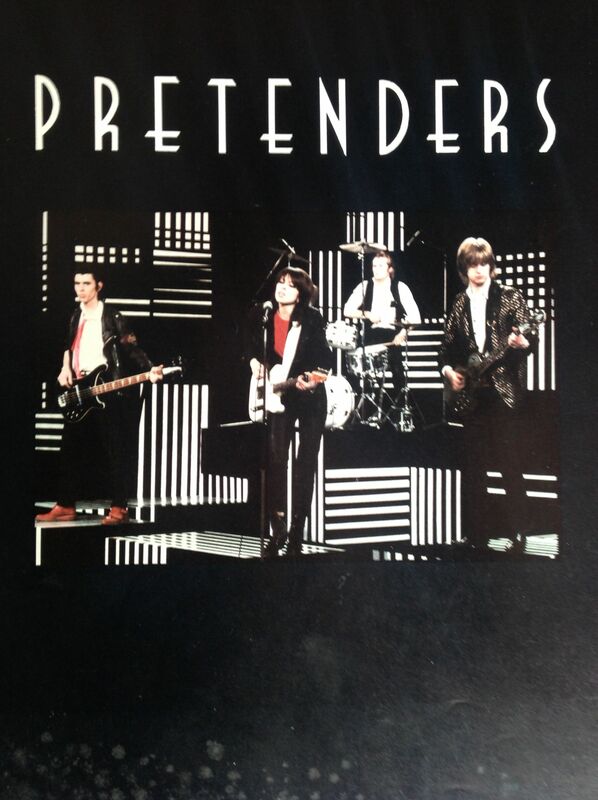 In January of 1980 the Pretenders hit No 1 in the UK charts with “Brass in Pocket”. 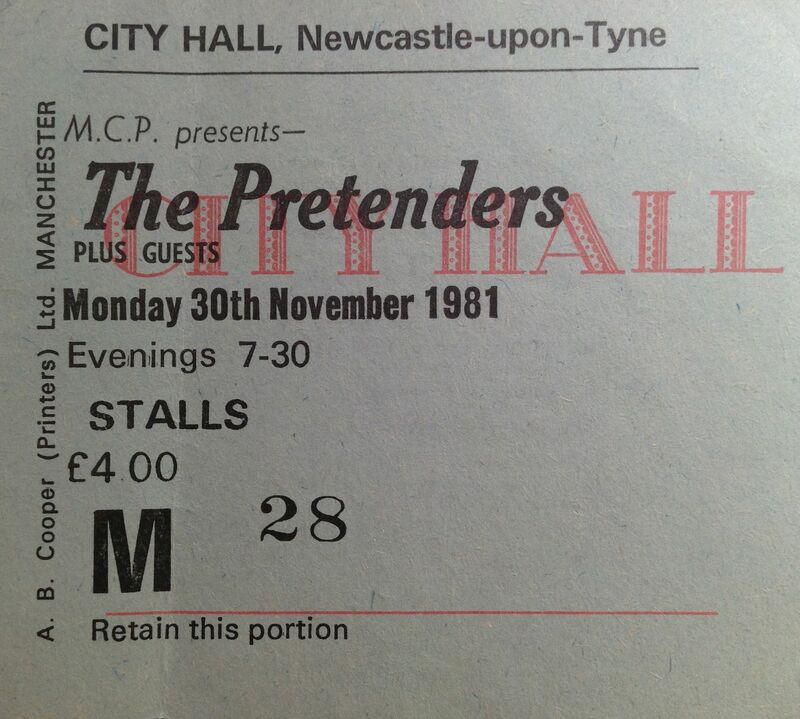 On 8th February 1980 I saw them play to a packed, sold out, Newcastle Polytechnic. They gave a storming performance, and Chrissie was simply amazing. This was the best time I have seen them in concert, and a gig that sticks in my mind as something pretty special. It was one of those nights where you felt that you were seeing a band on the verge of the big time, they knew it, we knew it and the atmosphere was electric; I think they may have been No 1 the week of the gig. 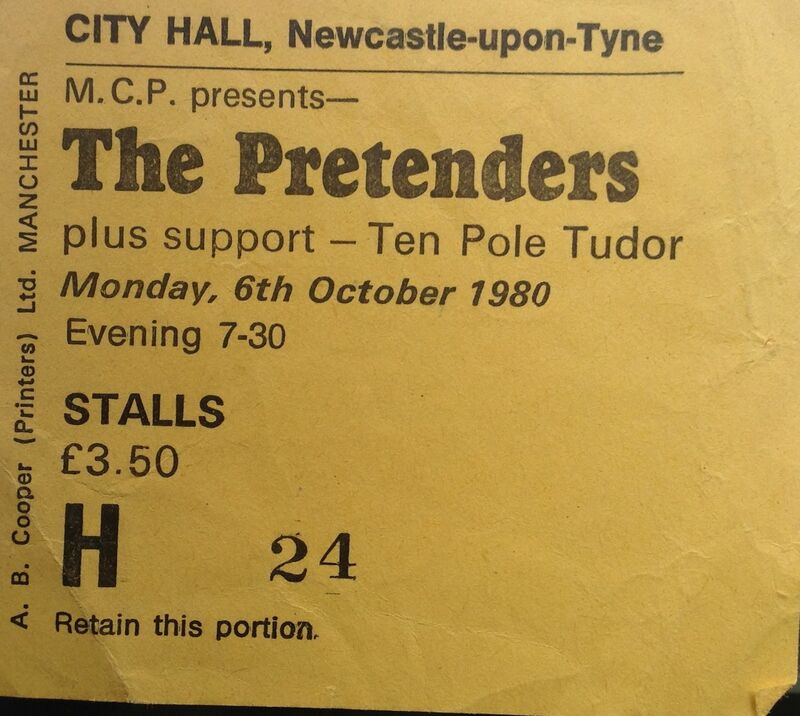 From there on the next couple of visits to Newcastle were to the City Hall; on 6th October 1980 with (Swords of 1000 men) Ten Pole Tudor as support and again on 30th November 1981. The Pretenders were a great live act; Chrissie all swagger, tunes with great hooks, and a sense of their ’60s pop roots blended with punk and new wave. By the end of 1982 both Pete Farndon and James Honeyman-Scott had died from drug overdoses, and it seemed that the band would be no more. However they were to regroup in 1983, and were back at the City Hall in 1984. I’ll blog about that gig tomorrow.